Good friend of the blog, Paul F. McDonald, author of the outstanding book, The Star Wars Heresies: Interpreting the Themes, Symbols, and Philosophies of Episodes I-III (I highly recommend this book to any Star Wars fan wishing to explore the deeper meanings of the Saga), recently wrote a brief essay on his site entitled, “You Can’t Go Home Again.” Paul examines a growing ambivalence he felt regarding Star Wars in a post-Lucas world, but how two things brought him back to full-throated Star Wars fandom: 1) Star Wars Rebels, and 2) the Force Awakens Teaser. I certainly agreed with him about Rebels, and the news coming out of the Star Wars Anthology: Rogue One panel filled me with excitement. But I still had a great deal of concern about the future of Star Wars sans George Lucas. 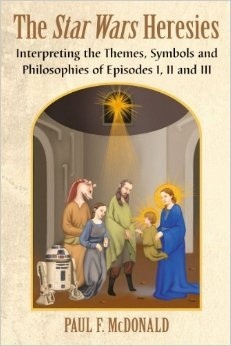 Could Lucasfilm tell the kinds of rich, deeply layer stories George had with the Saga and The Clone Wars. There was kind of a maddening tug of war going on with the fan within me. On the one hand there was all kinds of news coming out of Celebration that as a fan really got me jazzed, however, JJ’s statements about the themes of Star Wars and his constant catering to a particular portion of the fanbase still left me deeply troubled. But, Paul brought up one great point in his essay that I had to consider… one of the central themes of the Prequel Trilogy is learning to let go of the things we are attached to… and that even included George. George is gone, and I needed to come to terms with that. While that is something I’m going to still wrestle with for some time, looking back on the hundreds and hundres of Star Wars stories told in books, comics, and short stories I’ve collected over the years there have been plenty of Star Wars stories told by authors that have the same depth and emotional resonance as George’s Saga. 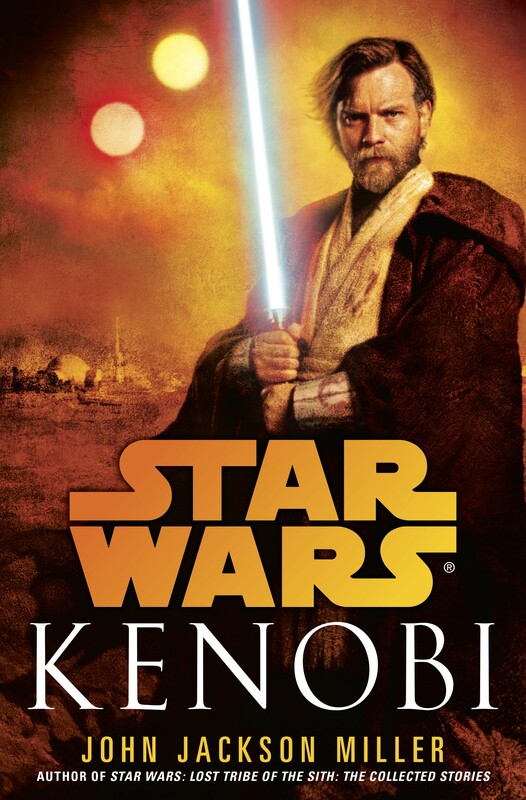 One book in particular, “Kenobi,” by frequent Star Wars novelist John Jackson Miller, is one of the finest Star Wars tales ever told and would be a worthy addition to the Star Wars film legacy. Star Wars didn’t just have to be about George and his wishes, and although I still wish George was involved at Lucasfilm, those days are gone. I still stand by my earlier criticisms of JJ Abrams, and I still have a lot of concern about the film he will deliver in December. Not because of Lucas’ absence, but Abrams abilities as filmmaker and storyteller, and his own views of the Saga which I find to be very constrictive. But overall I have to admit the materials coming out of Lucasfilm since George’s departure have only honored what came before, and have fit in quite nicely as part of a larger tapestry of the overall Saga. From the remaining Clone Wars stories, to Rebels, and the books and comics, it’s clear the Star Wars Story Group, led by Kiri Hart, takes its job seriously, and will do their best to deliver quality Star Wars stories that even George would be proud to have his name attached to. The final piece which really helped me to let go of George and just try to enjoy the Star Wars that was coming was rewatching a special video produced for starwars.com following the release of Revenge of the Sith. The Journey was a two part video released the Summer of 85 as both a “Thank you” to George, and a “Thank you” to the fans. 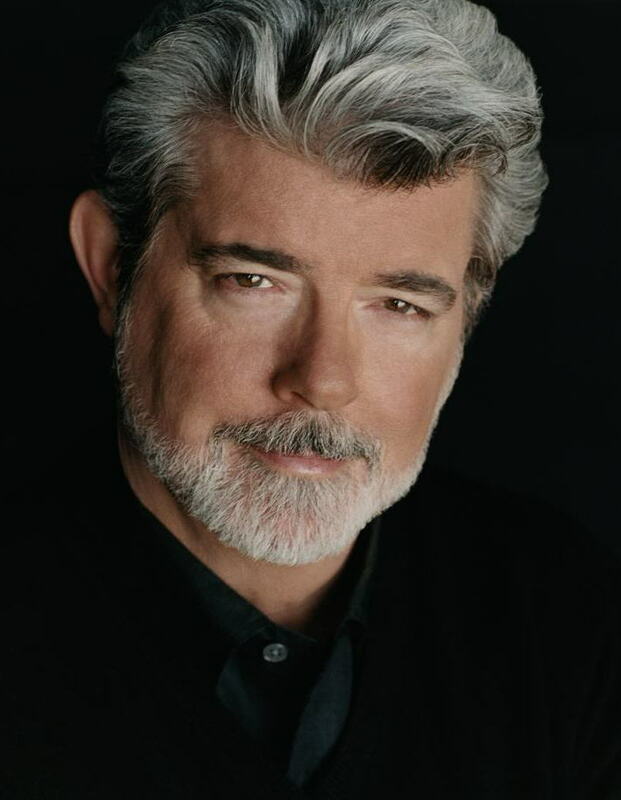 While Clone Wars had been announced by George it appeared the cinematic Saga was over and George would soon retire leaving Star Wars to television. As fans we would no longer share that communal bond in a darkened theater and would have to be content enjoying the Saga, and stories to come, in the comfort of our living rooms…. no longer joined as fans. Looking at this video as a “goodbye,” from George really helped me say “Farewell,” to him as the guardian of the Star Wars galaxy. Friend of the blog, Lazy Padawan has written a terrific piece celebrating the 30th Anniversary of the very first Star Wars spin off film, The Ewok Adventure: Caravan of Courage. Like Lazy Padawan, I fondly remember sitting down to it on a Sunday night three decades ago, and once again being transported to that far away galaxy. Sure some of the acting was a little rough, and some of the effects were a little dodgy, but the film was a cute, whimsical little adventure for kids, and still managed to touch on some big thematic elements found in many children’s fairy tales. Again, I highly recommend you check out Lazy Padawan’s Holocron, as well as her other blog, the Star Wars Prequel Appreciation Society, where she posts some terrific Prequel related news and articles. Also, in honor of the show’s 30th Anniversary, the Official Site has posted a summary of 9 Things You Never Knew About The Ewok Adventure. So you might want to give that a read through as well. Anyway, I’ll be off for the next couple of days celebrating Thanksgiving with the family, and I think I may just give The Ewok Adventure another spin over the holiday, as well as its follow up, The Battle For Endor. This past April, Lucasfilm announced, via the Official Star Wars website, that going forward, only the six films of George Lucas’ Star Wars Saga, and The Clone Wars television series would be counted as official canon (meaning they are a part of official Star Wars history). Additionally, all future comics, books, short stories, television projects, and films would now be part of a cohesive whole and conform to that canon. They also established that all books and comics previously released would now carry the moniker of “Legend” status, and would no longer be considered any part of Star Wars lore. Lucasfilm was free to use characters, ideas, and stories from those releases for future projects, but from the perspective of the new Star Wars Story Group (responsible for shepherding the Saga going forward), these stories were now apocryphal. The news was met by fans with a mixture of ambivalence, elation, shock, and horror depending on what side of the Expanded Universe as canon argument you fell on. Some within fandom saw the announcement as a good thing, giving Lucasfilm and Disney a fresh start to tell new stories without the baggage of previously established stories. Others saw the announcement as the ultimate betrayal of fans of the Expanded Universe who had loyally followed their favorite characters through hundreds of adventures told in books and comics, and were now being dumped on their heads. 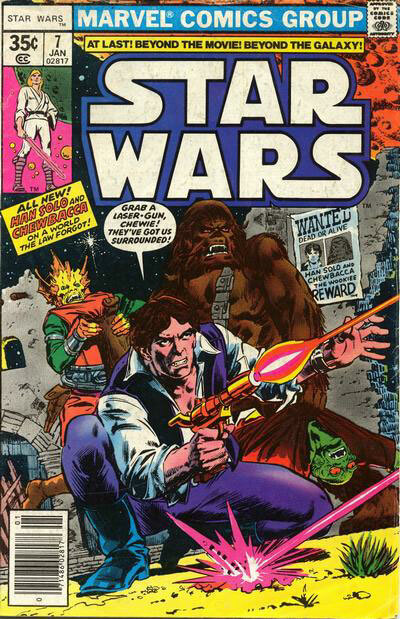 What became known as the Star Wars Expanded Universe (meaning stories told outside of the movies) began with issue #7 of the Marvel Comics Star Wars series which began to tell stories of what took place to our heoric Star Warriors following the Battle of Yavin. 1978 saw the release of the first spin off novel, Splinter of the Mind’s Eye, which was followed shortly by a series of Han Solo novels written by Brain Daley. A series of Lando Calrissian novels came later after the release of The Empire Strikes Back. At the time there was really no need to consider the continuity between the novels and the comics since there were only a handful of stand alone novels which had no bearing on what Marvel was doing with the comics. 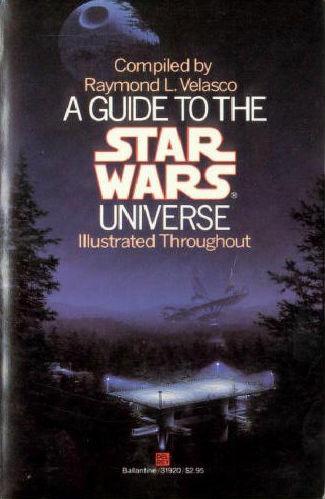 However, in 1984, following the conclusion of the Original Trilogy, author Raymond L. Velasco tried to put all of the information collected in the films, novels, and comics into one guide book of the Star Wars Universe. A Guide to the Star Wars Universe was the first attempt to gather the history, people, and places of that far away galaxy in one place. But the universe was about to explode in 1987. For the 10th Anniversary of Star Wars roleplaying design company, West End Games, released the 1st Edition of their Star Wars Roleplaying Game, along with the Star Wars Sourcebook. The era of the Expanded Universe was born. In the years that followed West End released books revealing the inner working of the Empire, the Rebel Alliance, and the aliens and planets that made up the universe. 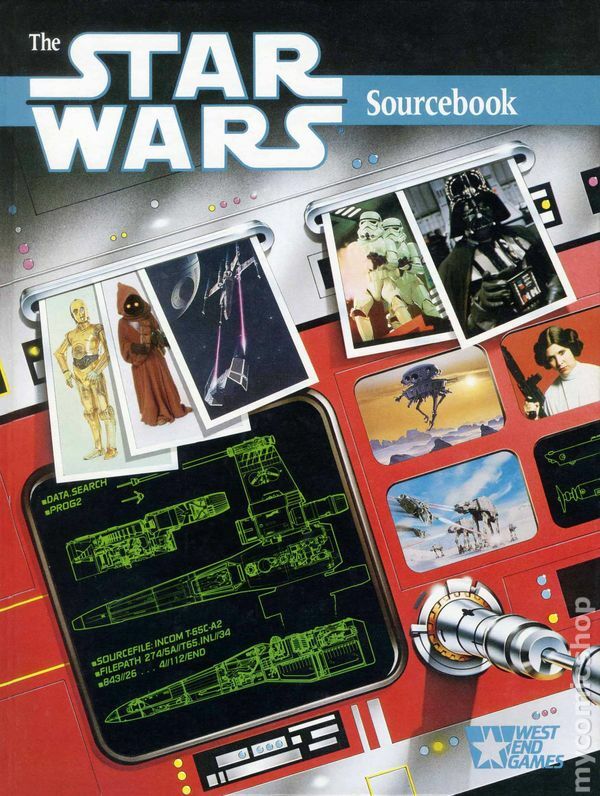 The game became an instant hit with gamers and non gamers, and the Star Wars sourcebooks that were released became required reading for serious fans. However, 1991 would go down as probably the most important year in the history of the Expanded Universe with two seminal releases that would change how Star Wars stories were marketed and revive the series among the general public. 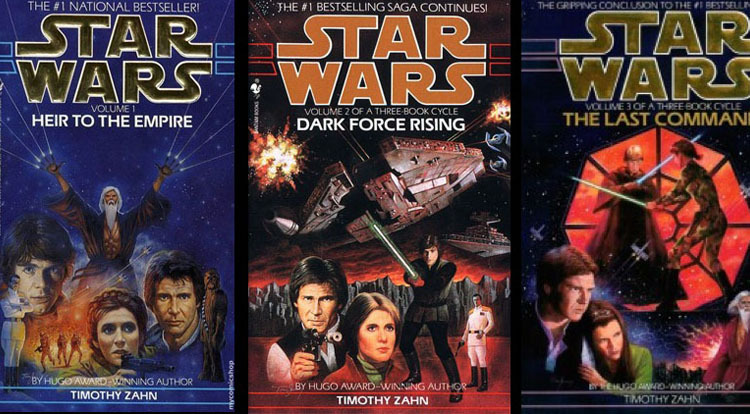 Heir to the Empire, written by science fiction author Timothy Zahn, to the story of Han, Luke, and Leia years after their victory at the Battle of Endor. A New Republic had emerged, and the Star Warriors were once again called to protect the universe from the Empire, under the direction of the evil Grand Admiral Thrawn. The book became an instant bestseller, and sparked a wave of more adult novels. Meanwhile, later that year, Dark Horse Comics secured the Star Wars license and launched their own post-Jedi story, Dark Empire, which saw Luke Skywalker taking on a resurrected clone Emperor Palpatine. The six issue miniseries (which was originally intended as a Marvel release) became Dark Horse’s best selling title to date, and Dark Horse immediately commissioned new comic titles. For the next 20 years both Dark Horse and Bantam/Del Rey books released hundreds of stories which all became part of a larger Star Wars experience known as the Expanded Universe. Lucasfilm tried to keep it all under control ensuring that continuity was maintained between various comics, novels and video games. Eventually, the company attempted to set some firm rules about what constituted official Star Wars lore, and what was part of the Expanded Universe’s continuity. Lucasfilm devised a muti-tiered program with the movies, and later The Clone Wars television series being called “G-Level canon,” meaning official Star Wars canon coming directly from creator George Lucas. 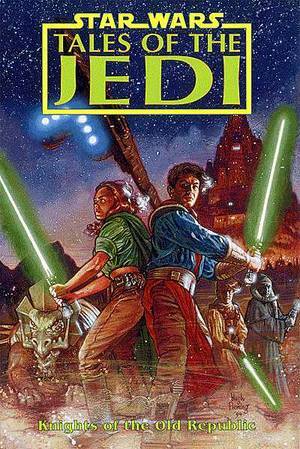 Comics, most novels, and video games became a separate part of the Expanded Universe’s continuity and were intended not to conflict with each other. 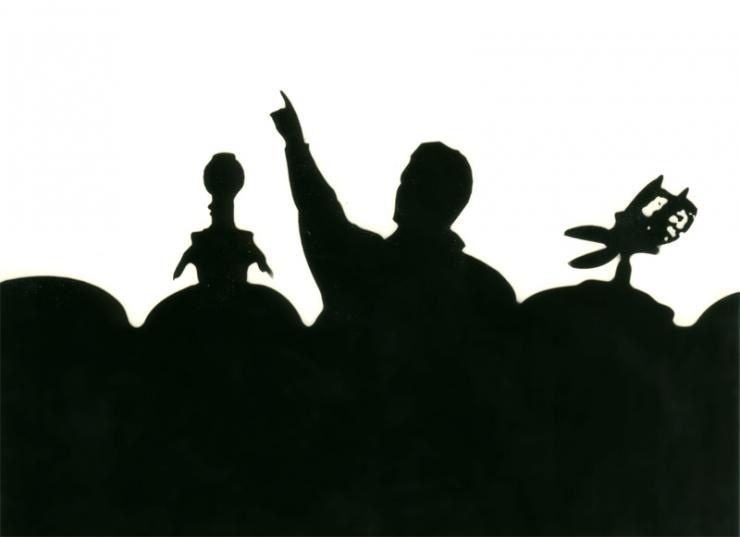 Finally, other projects like The Star Wars Holiday Special, the Ewoks movies and cartoon series, the Droids animated show, and other projects were their own animal. The two main continuity lines appeared to live together, but separate for a number of years, rarely intersecting or conflicting with each other. However, that began to change as The Clone Wars animated series began to explore ideas and characters that creator George Lucas was interested in. Of course with hundreds of books, comics, and short stories telling new adventures, or filling in gaps left by the movies there were bound to be contradictions. The first big salvo was about to be fired over the backstory of the Mandalorians. Lucas first devised the name Mandalorian when working on The Empire Strikes Back. According to the novelization they were a group of super commandos who hunted down the Jedi Knights. Following the release of Jedi, it did not appear that Lucas would be revisiting Boba Fett’s backstory, or the history of the Mandalorians, so comic authors and novelists felt safe digging into the mysteries of Boba Fett and the Mandalorian people. That changed with Attack of the Clones when Lucas first revealed the origins of Boba Fett and his bounty hunter father, Jango Fett. Following that film’s release, author Karen Traviss authored a series of Clone Trooper books which went into great detail about the Mandalorians, their culture, history, and language. Her writing on the subject was so in depth that it gave rise to a subculture of the Star Wars fanbase that was dedicated to all things Mando. Unfortunately, the reality of Star Wars canon and what was considered the “real” history of Star Wars would be at odds with Traviss’ work when Lucas decided it was time to visit Mandalore itself in The Clone Wars. 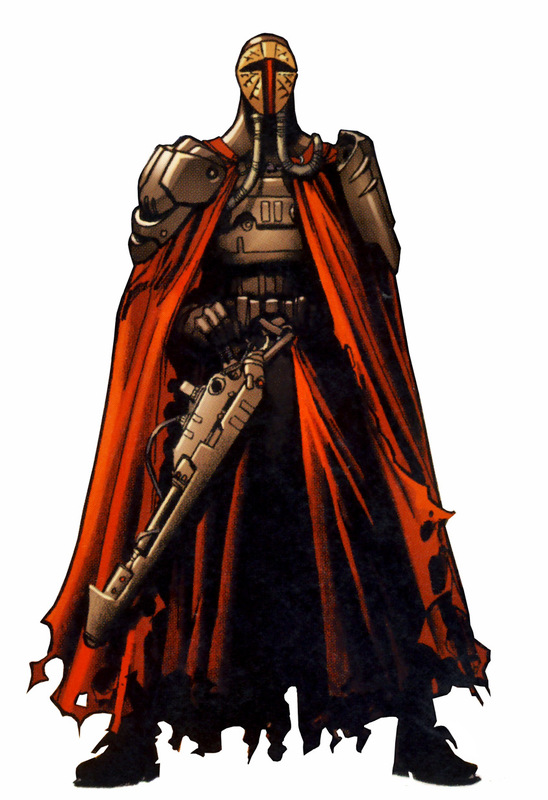 Instead of a noble warrior culture as Traviss envisioned, Lucas saw Mandalore as a pacifist world that had turned its back on its warrior past and was trying to find peace in a galaxy at war. In a three-part arc, the current ruler of Mandalore, the Duchess Satine, is trying to quell a rebellion by Death Watch, descendants of the Mandalorian warriors, while trying to keep her homeworld out of the Clone Wars. Needless to say, the reaction among fans of Traviss’ Mandalorians was extremely negative. Some accused Lucas of violating canon and implied that Traviss had created the “official” history of the Mando culture. Others suggested Lucas was nothing more than a hack, strip mining Traviss’ good ideas, while injecting his own “crappy” ones. It was at this point that I realized that Lucasfilm was simply in an untenable position. Of course fans would continue to bicker endlessly about canon and the Expanded Universe’s place in the Star Wars legend. 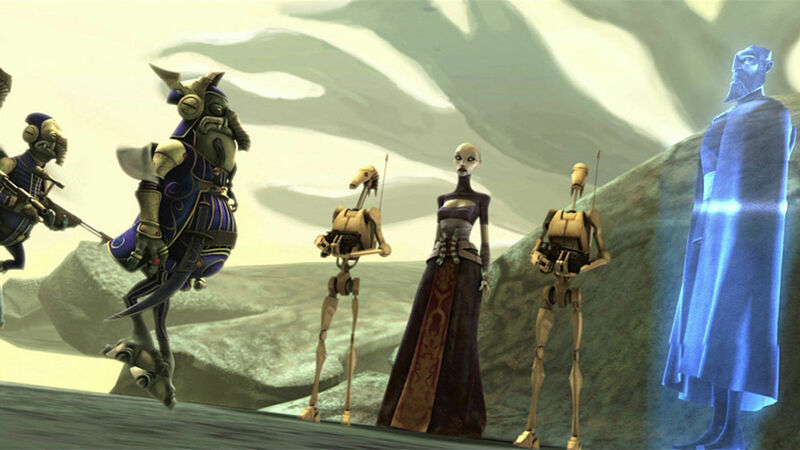 Some argued that The Clone Wars was not canon, others devised their own hybrid canon including some portions of the EU as part of the “official” Star Wars story. However, the Disney purchase of the Star Wars license changed everything. Unfortunately this announcement was met by a lot of push back. Fans had become attached to many EU characters like Luke Skywalker’s wife, Mara Jade, or Han and Leia’s children, Jacen, Jaina, and Anakin Solo. Other fans were immersed in the ancient history of Star Wars told in the Old Republic series. The EU was a rich and diverse universe with many memorable characters of its own, and suddenly being told that these stories “don’t count” had to be a little jarring. Naturally there was bound to be some disappointment, but some fans took things to a bit of an extreme. From my own point of view, I’m happy with the change. I never really viewed the hundreds of comics and books as having any impact on the stories George Lucas was trying to tell. I never once considered him sitting down to write the treatment for Episode VII, then reading a copy of Heir to the Empire and quietly saying to himself, “Dammit, Han and Leia have twins? What am I going to do?” As a long time Star Trek fan who read the comics and most of the novels during the 80s, I was intimately familiar with the concept of canon and ancillary merchandising. I guess my backgound in film studies helped me grasp the idea that while all of these new characters and adventures can be exciting, in the grand scheme of things they really don’t amount to much to the filmmaker and his creative process; they are nothing more than a revenue stream. I know it’s a somewhat cynical attitude, but it’s true. I doubt in the 30 plus years that Lucas controlled the Star Wars empire that he ever cracked open a Star Wars novel or seriously read one of the many comic series. He simply did not have time for that. Over the years the sheer volume of books coming out from Bantam/Del Rey had led to a very spotty track record. For every Kenobi, or I, Jedi, or Allegiance, there were a handful of books which were painful to read. Concepts like the Yuzzan Vong, a clear attempt to cash in on the Star Trek Borg craze fell flat, and simply didn’t feel much like Star Wars. 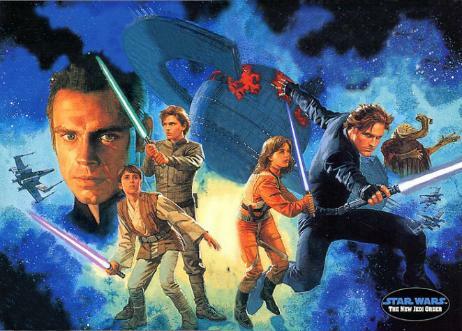 Lengthy book series like The New Jedi Order, Legacy of the Force, and Fate of the Jedi were mix of good and awful novels which tested the reader’s patience. And I understand that change is hard; I really sympathize with EU fans who feel betrayed by Lucasfilm/Disney. There are a lot of fans out there who were introduced to Star Wars through the EU, so these stories hold a special place for them. To them Jaina Solo is just a vibrant and real as Luke and Leia. But the reality is these characters aren’t going anywhere, as long as you stay invested in them. Sure there wont be any new licensed adventures featuring the heroes and villains of the EU, but its clear they are not being totally abandoned. Del Rey is re-releasing many of the classic EU novels with the new “Legends” banner, and even Marvel will be releasing collections of selected series of Dark Horse Star Wars comics as part of the “Legends” series. There’s no reason EU fans can’t introduce other Star Wars fans, or non fans to many of these classic stories. The EU hasn’t gone anywhere… it’s just taking a different path. I would urge any EU fans out there who have given up on the new continuity to give it a chance. 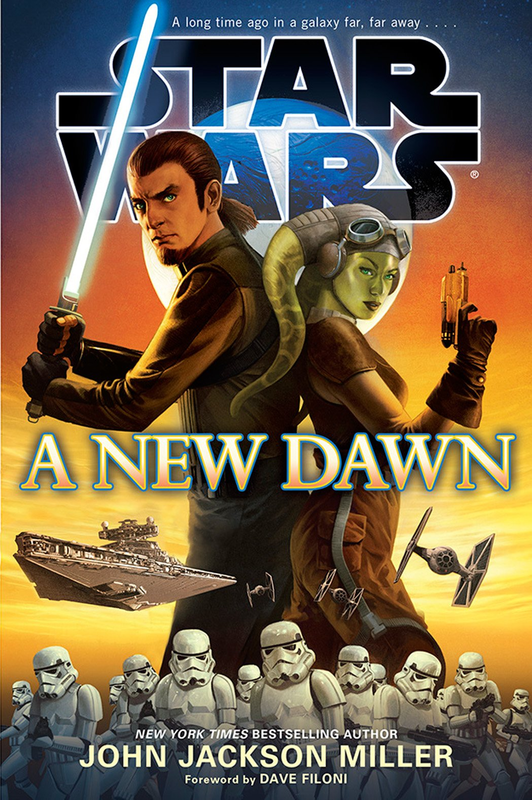 The first official novel released under the new canon, A New Dawn, by longtime Star Wars author John Jackson Miller is an outstanding book (I’ll post a review soon) and a worthy successor to the long line of EU classics. James Luceno’s Tarkin has also been receiving great advanced reviews. Additionally, a couple of the upcoming Marvel comics sound intriguing like the Kanan spin off comic and the upcoming Leia miniseries. 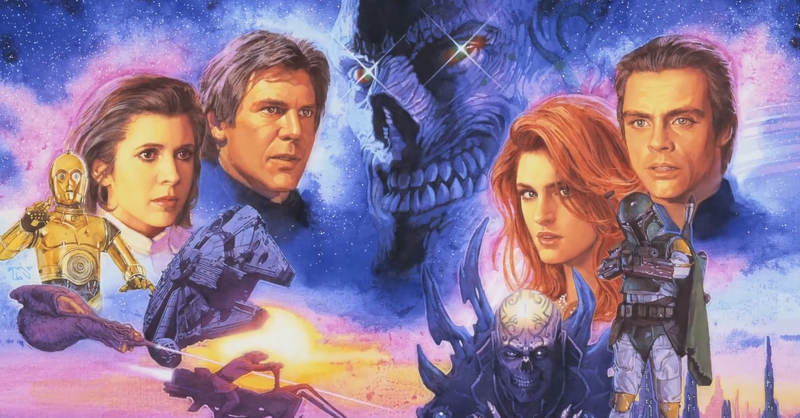 While the era of the Star Wars Expanded Universe has come to a close, there appears to be a bright future ahead for quality books and comics that fans can enjoy while we wait for the latest big screen Star Wars adventure. From time to time I plan on revisiting The Clone Wars animated series and review selected episodes that really stand out to me. I hope these reviews will encourage readers who have not watched The Clone Wars to seek out the show and give it a chance. There are a number of wonderful episodes which rival even the movies in terms of story, character and thematic content. One of those episodes is the show’s premiere episode, Ambush. It’s a strong message peppered throughout this episode. As our story begins, Master Yoda and a convoy of Republic ships are en route to one of the moons of Toydaria, Rugosa, where the Jedi Master plans to meet with Toydarian King Katuunko to negotiate the construction of a base to protect the system from the forces of the Separatists. Unfortunately the convoy is intercepted by the forces of Separatist leader, Count Dooku, and Yoda, along with three Clone Troopers are forced to use an escape pod to land on Rugosa so Yoda can make this important meeting. Meanwhile the Separatist army, led by Dooku’s secret apprentice, Ventress, arrive on the planet and intercept the King and strongly suggest he join the Separatist cause. Ventress claims Yoda is dead, and the Republic is too weak to protect his world. However, the King says he is a man of his word, and still plans to at least meet with the Jedi Master. He offers a counter proposal; if Yoda can still make the negotiations in person, and get past the Separatist army, he will join the Republic, if Yoda fails he will side with Dooku. The evil Count agrees to the terms and the race is on. Over the course of the next 15 minutes we are treated to a light-hearted, exciting adventure as Yoda leads three Clone Troopers through a gauntlet of sometimes dangerous, sometimes inept Separatist battle droids. 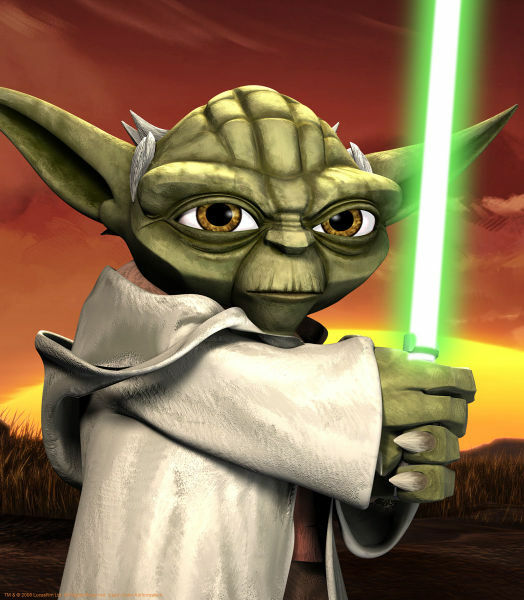 Yoda’s expertise with the lightsaber, and brilliant tactical keep our heroes out of harms way. His wisdom inspires the Clone Troopers who manage to save the Jedi Master in the end when he is trapped. Of course Dooku has no intentions of abiding by his deal with the Toydarian King and orders Ventress to dispose of him, but Yoda and the clones arrive just in time, and the old Jedi Master disarms the young Sith apprentice who turns tail and escapes. Ambush is a quaint little adventure and a strong kick off to the show with a strong message for young viewers: Regardless of your size, your ability, or your circumstances, we all have a destiny; and if you listen to the wisdom of those around you, you can accomplish things you did not even think you were capable of. For years voice over artist Tom Kane had been the official Lucasfilm voice of Yoda for work in video games, commercials, and other animated projects so it was only natural that he would carry on as the venerable Jedi Master in The Clone Wars. Kane’s performance is simply stunning, and he inhabits the role in a way that feels familiar and fresh. Kane’s Yoda has a younger sound and the character feels more like he did in his first appearance back in 1980 in The Empire Strikes Back. There’s a sense of humor and playfulness that was missing during the Prequel era. But Yoda is not all fun and games; there is also an amazing amount of depth and humanity Kane brings to the part. In one standout moment, Yoda speaks with each of the clones calling them by their name. He explains to them that while they are the same they are individuals with their own destinies, and just like all life, are tied to the Force. It is a powerful moment with a very important lesson for young viewers. Clone Wars design team and writers do a great job of making each of the Clone Troopers distinguishable from each other, but it is really the vocal performance of Dee Bradley Baker that breaths life into Thire, Jek, and Rys. Somehow Baker is able to give each Trooper his own distinctive style and manner of speech which elevates these troops from mere clones to individual human beings. 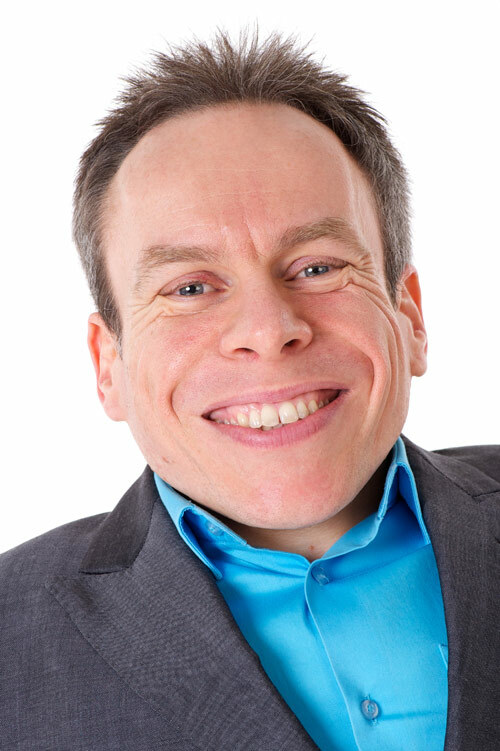 Baker’s talents are stretched in further in episodes later on in the series when he is given even more troops to characterize on screen. His work only makes the betrayal by the Clones during Order 66 in Revenge of the SIth even more heartbreaking. Kevin Kiner had an insane task ahead of him, and somehow he managed to come through with flying colors. When George Lucas approached Kiner to score the series he had two demands: Each planet the show visited was to have its own musical sound influenced by real earth cultures, and Kiner was to refrain for using the Williams library of Star Wars music as much as possible. Kiner had to develop his own musical style for the show, and turned to both his background in rock music and his experience as a traditional film and television composer. In the early episodes of the series Kiner’s work has an original sound that feels different, but right for the Star Wars universe. However, Ambush makes ample, yet restrained, use of the Yoda Theme throughout the episode to great effect. This episode’s score is both familiar and new, and works beautifully. There’s really not a lot to criticize about Ambush. It’s a wonderful story with a solid script and great vocal performances. If there is one weak area with the series during its freshman season it is the animation. Characters are not nearly as detailed as their models in subsequent seasons (or even later in the first season), and their movements are not nearly as fluid; so this might be a little jarring for new viewers who might be binge watching. However, the unique stylized visuals make for a very interesting looking show reminiscent of the old Thunderbirds marionette series from the 60s; it certainly stands out from other animated shows of the era. Overview: Ambush is a terrific premiere to what would become a multiple Emmy Award winning show, and would introduce new fans to the Star Wars Saga, while keeping the fire alive for older fans. Ambush is filled with action, humor, and some wonderful character moments which help elevate the Clone Troopers from simple soldiers indistinguishable from each other to individuals with their own ambitions (this will become an important theme as the series goes on). Of course Yoda is the heart of this episode, and Tom Kane’s performance injects a playful impishness we have not seen from the venerable Jedi Master since The Empire Strikes Back. And while this story is fairly simple and straightforward, there’s a certain elegance to Ambush’s simplicity. Earlier this week I wrote about my experiences with spoilers; specifically Vader’s major revelation at the end of The Empire Strikes Back. Spoilers don’t really bother me, I actual enjoy uncovering the secrets of a film and then later see how those events unfold in the context of the finished film. Every Star Wars film usually has interesting concepts that either make it through preproduction, or to the scripting phase, or are even filmed, but later rejected. Empirehad Wampas attacking the Hoth base, Jedi had Obi-Wan revealing to Luke that Uncle Owen was his brother, and Sith had its own “I am your father” moment between Palpatine and Anakin. While none of these ideas made it to the finished product, they make for interesting speculation. Initially, when spoilers began to leak regarding Episode VII I was fairly ambivalent. Most rumors concerned remnant forces of the Empire along with potential Sith baddies running around the galaxy stirring up trouble. I had a number of problems with these from a storytelling point of view. They simply felt old and worn out like recycled bits from post-Jedi Expanded Universe books and comics. I also had a big problem with how they impacted the previous six films on a thematic level….